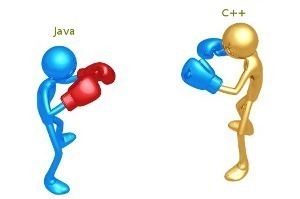 EngineerOne: Differences between Java and C++. This lesson introduces you to Java programming by presenting some of the similarities and differences between Java and C++. 1. Java does not support typedefs, defines, or a preprocessor. Without a preprocessor, there are no provisions for including header files. 2. Since Java does not have a preprocessor there is no concept of #define macros or manifest constants. However, the declaration of named constants is supported in Java through use of the final keyword. 3. Java does not support enums but, as mentioned above, does support named constants. 4. Java supports classes, but does not support structures or unions. 5. All stand-alone C++ programs require a function named main and can have numerous other functions, including both stand-alone functions and functions, which are members of a class. There are no stand-alone functions in Java. Instead, there are only functions that are members of a class, usually called methods. Global functions and global data are not allowed in Java. 6. All classes in Java ultimately inherit from the Object class. This is significantly different from C++ where it is possible to create inheritance trees that are completely unrelated to one another. 7. All function or method definitions in Java are contained within the class definition. To a C++ programmer, they may look like inline function definitions, but they aren't. Java doesn't allow the programmer to request that a function be made inline, at least not directly. 8. Both C++ and Java support class (static) methods or functions that can be called without the requirement to instantiate an object of the class. 9. The interface keyword in Java is used to create the equivalence of an abstract base class containing only method declarations and constants. No variable data members or method definitions are allowed. (True abstract base classes can also be created in Java.) The interface concept is not supported by C++. 10. Java does not support multiple inheritance. To some extent, the interface feature provides the desirable features of multiple inheritance to a Java program without some of the underlying problems. 11. While Java does not support multiple inheritance, single inheritance in Java is similar to C++, but the manner in which you implement inheritance differs significantly, especially with respect to the use of constructors in the inheritance chain. 12. In addition to the access specifiers applied to individual members of a class, C++ allows you to provide an additional access specifier when inheriting from a class. This latter concept is not supported by Java. 13. Java does not support the goto statement (but goto is a reserved word). However, it does support labeled break and continue statements, a feature not supported by C++. In certain restricted situations, labeled break and continue statements can be used where a goto statement might otherwise be used. 14. Java does not support operator overloading. 15. Java does not support automatic type conversions (except where guaranteed safe). 16. Unlike C++, Java has a String type, and objects of this type are immutable (cannot be modified). Quoted strings are automatically converted into String objects. Java also has a StringBuffer type. Objects of this type can be modified, and a variety of string manipulation methods are provided. 17. Unlike C++, Java provides true arrays as first-class objects. There is a length member, which tells you how big the array is. An exception is thrown if you attempt to access an array out of bounds. All arrays are instantiated in dynamic memory and assignment of one array to another is allowed. However, when you make such an assignment, you simply have two references to the same array. Changing the value of an element in the array using one of the references changes the value insofar as both references are concerned. 18. Unlike C++, having two "pointers" or references to the same object in dynamic memory is not necessarily a problem (but it can result in somewhat confusing results). In Java, dynamic memory is reclaimed automatically, but is not reclaimed until all references to that memory become NULL or cease to exist. Therefore, unlike in C++, the allocated dynamic memory cannot become invalid for as long as it is being referenced by any reference variable. 19. Java does not support pointers (at least it does not allow you to modify the address contained in a pointer or to perform pointer arithmetic). Much of the need for pointers was eliminated by providing types for arrays and strings. For example, the oft-used C++ declaration char* ptr needed to point to the first character in a C++ null-terminated "string" is not required in Java, because a string is a true object in Java. 20. A class definition in Java looks similar to a class definition in C++, but there is no closing semicolon. Also forward reference declarations that are sometimes required in C++ are not required in Java. 21. The scope resolution operator (::) required in C++ is not used in Java. The dot is used to construct all fully-qualified references. Also, since there are no pointers, the pointer operator (->) used in C++ is not required in Java. 22. In C++, static data members and functions are called using the name of the class and the name of the static member connected by the scope resolution operator. In Java, the dot is used for this purpose. 23. Like C++, Java has primitive types such as int, float, etc. Unlike C++, the size of each primitive type is the same regardless of the platform. There is no unsigned integer type in Java. Type checking and type requirements are much tighter in Java than in C++. 24. Unlike C++, Java provides a true boolean type. 25. Conditional expressions in Java must evaluate to boolean rather than to integer, as is the case in C++. Statements such as if(x+y)... are not allowed in Java because the conditional expression doesn't evaluate to a boolean. 26. The char type in C++ is an 8-bit type that maps to the ASCII (or extended ASCII) character set. The char type in Java is a 16-bit type and uses the Unicode character set (the Unicode values from 0 through 127 match the ASCII character set). For information on the Unicode character set see http://www.stonehand.com/unicode.html. 27. Unlike C++, the >> operator in Java is a "signed" right bit shift, inserting the sign bit into the vacated bit position. Java adds an operator that inserts zeros into the vacated bit positions. 28. C++ allows the instantiation of variables or objects of all types either at compile time in static memory or at run time using dynamic memory. However, Java requires all variables of primitive types to be instantiated at compile time, and requires all objects to be instantiated in dynamic memory at runtime. Wrapper classes are provided for all primitive types except byte and short to allow them to be instantiated as objects in dynamic memory at runtime if needed. 29. C++ requires that classes and functions be declared before they are used. This is not necessary in Java. 30. The "namespace" issues prevalent in C++ are handled in Java by including everything in a class, and collecting classes into packages. 31. C++ requires that you re-declare static data members outside the class. This is not required in Java. 32. In C++, unless you specifically initialize variables of primitive types, they will contain garbage. Although local variables of primitive types can be initialized in the declaration, primitive data members of a class cannot be initialized in the class definition in C++. 33. In Java, you can initialize primitive data members in the class definition. You can also initialize them in the constructor. If you fail to initialize them, they will be initialized to zero (or equivalent) automatically. 34. Like C++, Java supports constructors that may be overloaded. As in C++, if you fail to provide a constructor, a default constructor will be provided for you. If you provide a constructor, the default constructor is not provided automatically. 35. All objects in Java are passed by reference, eliminating the need for the copy constructor used in C++. 37. There are no destructors in Java. Unused memory is returned to the operating system by way of a garbage collector, which runs in a different thread from the main program. This leads to a whole host of subtle and extremely important differences between Java and C++. 38. Like C++, Java allows you to overload functions. However, default arguments are not supported by Java. 39. Unlike C++, Java does not support templates. Thus, there are no generic functions or classes. 40. Unlike C++, several "data structure" classes are contained in the "standard" version of Java. More specifically, they are contained in the standard class library that is distributed with the Java Development Kit (JDK). For example, the standard version of Java provides the containers Vector and Hashtable that can be used to contain any object through recognition that any object is an object of type Object. However, to use these containers, you must perform the appropriate upcasting and downcasting, which may lead to efficiency problems. 41. Multithreading is a standard feature of the Java language. 42. Although Java uses the same keywords as C++ for access control: private, public, and protected, the interpretation of these keywords is significantly different between Java and C++. 43. There is no virtual keyword in Java. All non-static methods always use dynamic binding, so the virtual keyword isn't needed for the same purpose that it is used in C++. 45. The detailed implementation of the exception handling system in Java is significantly different from that in C++. 46. Unlike C++, Java does not support operator overloading. However, the (+) and (+=) operators are automatically overloaded to concatenate strings, and to convert other types to string in the process. 47. As in C++, Java applications can call functions written in another language. This is commonly referred to as native methods. However, applets cannot call native methods. 48. Unlike C++, Java has built-in support for program documentation. Specially written comments can be automatically stripped out using a separate program named javadoc to produce program documentation. Object handles (references) are automatically initialized to null. Handles are checked before accessing, and exceptions are thrown in the event of problems. You cannot access an array out of bounds. Memory leaks are prevented by automatic garbage collection.